Etsy has organized a Small Business Contest inviting shop owners to share their story. The way the contest works is that the shop with the most votes by midnight, April 6th wins $10,000 to grow their business. And this is where you come in. I would like to humbly ask for your support in this endeavor. 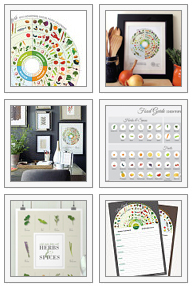 At Jessica Haas Designs, I believe that eating healthy is essential for our physical and emotional well-being. And it begins at home. JHD Seasonal Food Guide provides families with the knowledge and the information to bring home the freshest food possible. The winnings would go a long way in growing this business. So, please take a moment to visit my voting page and show your support. You will get to read my story on how this all got started and what I would do if I won the prize. So, please get your vote in soon, there’s only a few days until Thursday, April 6th, 2017. This entry was posted in Advertising, Appreciation, Design Event, Graphic Design, Promo and tagged #DifferenceMakesUs, Etsy contest, help grow my business, jessica haas designs, vote for JHD, vote to help me win. Bookmark the permalink.